Before you head off to a post office to send money home, you will need the following information to fill out the International Remittance form. You will only need this information if you are sending money to a bank account. One way is to visit the Okinawa map on the JP Post website, click your area and click on the closest post office to you. Under the “貯金・ATM” tab (green tab) scroll down to the “取り扱い内容” (Services Offered) and see if they have a circle next to “国際送金” (kokusai soukin, International Remittance). If they do, check their hours and head there right away. If you’re already at a JP Post Office, you can ask the bank teller something on the lines of “kokusai soukin dekimasu ka (Can I send an international remittance here? )” If yes, they will probably hand your a form to fill out. 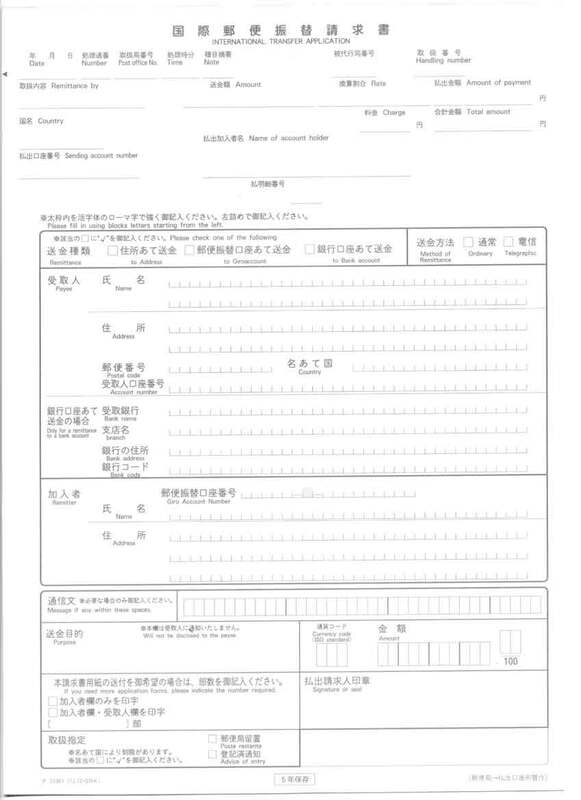 住所あて送金 (jyuusho ate soukin, Remittance to Address) – this one will require a recipient at the address. The best part of this process is that the form has English on it! Give the bank teller the application form, the money, and your residence card. They will take a few minutes to confirm the bank account (if you are send to a bank account). Afterwards they will give you the breakdown of the exchange rate and service fee (2,500 yen). After all that is taken care of, they will give you a receipt and in a week or two your money will arrive in your home bank account. The most widely known and used method is GoRemit. It means opening a remittance account GoRemit, which specialize in expat banking services. Sending money with GoRemit costs 2000 yen, not including the transfer fee from your Japanese bank account to your GoRemit account. On the other hand, most banks charge a 2500-3000 yen fee to receive the funds, so the total for using GoRemit could be more. In addition, unlike the post office, if you send before 3pm, the money is meant to be remitted same day. That’s a major plus over other methods. The more locations you can use Western Union, the more convenient it obviously is. You need to register first, and if you want to use 7-11 must do so again separately. You can only transfer money in person, but can add possible recipients to your account online. Again, if you do transfer money with Western Union, you’re not told the foreign exchange rate until after the funds arrive. The fees are the same as Family Mart’s. However, one major drawback is that with neither service are you told the exchange rate beforehand. This could leave you vulnerable to receive a bad rate. There’s also the fact that, to actually send money, you must go in person. it’s possible to transfer money overseas from many banks in Japan, although the specifics and costs of each varies. Some banks may require you to sign up for overseas remittance as a separate service. Also, some may only be able to remit to certain countries. Fees will depend on the bank, although it will likely be more expensive than some of the other options mentioned above (3500 yen and up seems to be common). Unless you use a bank that provides these services in English, you’ll have to navigate the process in Japanese.